"Here comes the star-studded show train... [honk honk!]" 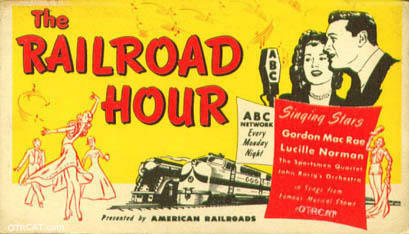 Called The Railroad Hour as it was sponsored by The Association Of American Railroads, this was a relatively late variety show that hearkened back to the classic days of American popular song entertainment. The stellar cast is led by star of Broadway and Hollywood, Mr. Gordon MacRae. Many of the major singing talents who guest stars and sings with Gordon are Jane Powell, Dorothy Kirsten, Lucille Norman, Ginny Simms, and Dorothy Warenskjold. Each week a different well-known operetta, Broadway show or Hollywood musical is featured. Sometimes a famous theme is adapted, such as "Robin Hood," or a period in musical history, such as "The Songs of 1915-1920." Jerome Lawrence or Robert E. Lee co-produced the later segments. Together, they created enduring works of the American theatre, including Inherit the Wind; The Night Thoreau Spent in Jail, which has been called "the most widely produced play of our time"; and Auntie Mame. 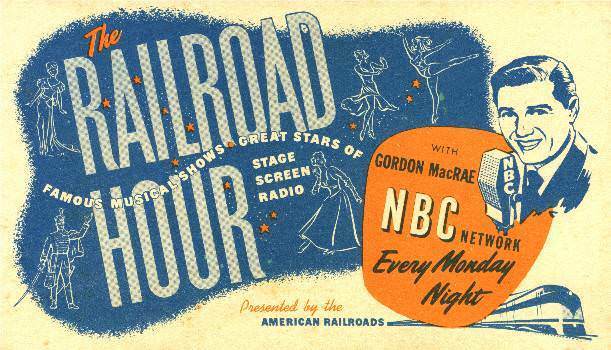 On The Railroad Hour, they were able to offer highlights of many of the shows of giants including Kern, Porter and Hammerstein, plus beloved classics of Operetta and Gilbert & Sullivan. The Carmen Dragon Orchestra provides the fine musical accompaniment, together with the Norman Luboff Choir. Marvin Miller is the announcer. Any listener who loves fine music or great old time radio entertainment will find The Railroad Hour one of the very best of its kind. The beautiful show melodies are well sung and enacted, and the first-class productions leave one wishing there were a show just like this now on television. Perhaps "Everybody Loves Raymond", but one has the feeling they just don't know what they're missing! For more music, you'll want to click on Glenn Miller, Bing Crosby, Command Performance, Your Hit Parade, The Sealtest Hour, and the Dinah Shore Collection. 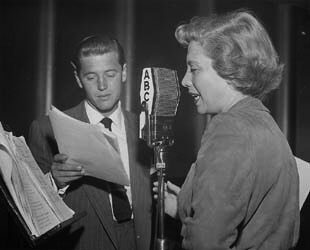 Some shows have great music in some of their segments, such as Phil Harris and Alice Faye Show (two tunes per show), Burns and Allen, and Dennis Day Show. If your tastes run to great western swing, you'll want to check out All Star Western Theater. For other railroad themed old time radio shows, see also: Railroad Collection, Empire Builders & Grand Central Station, Green Valley Line, and Mysterious Traveler. 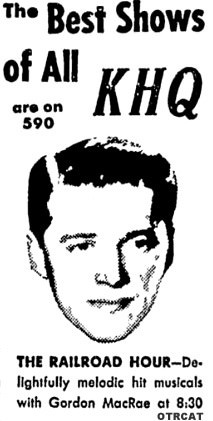 For more Gordon MacRae see also: The Gulf Spray Program and The Gordon MacRae Show (Texaco Star Theater).